New Fantasy Fiction Books Coming Soon! We're excited to announce our fall release (September 1, 2012) of The Brightworking: Book I of the Brightstone Saga for young adults. This new three-book fantasy fiction series, combines an original fantasy world in a medieval-type setting filled with magical inventions and creatures created by author, Paul B. Thompson. In Brightworking: Book I, Mikal, a blacksmith's son, enjoys working with fiery metal in his father's forge. But when the sorcerers' Guild of Constant Working comes to his small village, the young boy's destiny is changed forever. Before long, Mikal is apprenticed to the most powerful wizard in all of Phalia and confronts danger at every turn as he uncovers the mystery of the Brightworking. With the help from his friend Lyra and a magical metal head, she and Mikal confront danger at every turn as he uncovers the mystery of the Brightworking. Click here to reserve your copy today and you can look forward to the release of The Fortune Teller: Book II, and The Battle for the Brightstone: Book III in 2013. Don't forget to sign up for the Enslow raffle! Today's the last day to sign up for our monthly $100 in free books! David Aretha, who has written or edited thirty baseball books, has just come out with his initial sports fiction work. The book -- Rounding Third, Heading Home! -- is among the new Enslow Publishers fiction titles for the Spring 2012 season. Aretha's 112-page story, with its appealing narrative, intriguing characters, and exciting ending, is an excellent choice for readers in grades 3 through 6. Author Dan Gutman has praised Rounding Third, Heading Home!, stating that "If you like Matt Christopher,you'll love David Aretha. This is a classic underdog story that Little Leaguers are bound to enjoy." Aretha's blog, linked here, provides details about the inspiration for the book, as well as an excerpt from the work. Rounding Third, Heading Home! is available directly from Enslow Publishers in paperback for $9.95. A library-bound edition is also available to schools and libraries for $19.95; that price represents a 25% discount from Enslow's list price for the library-bound edition. Happy Memorial Day from Enslow! We would like to wish everyone a safe and happy Memorial Day and a big thank you to those who have served our country in the Armed Services. Memorial Day was first observed on May 30, 1868, when flowers were placed on the graves of Union and Confederate soldiers at Arlington National Cemetery. New York was the first state to officially recognize the holiday in 1873. By 1890, all of the northern states recognized the holiday. The South refused to recognize the day, honoring their dead on separate days until after World War I. It was after World War I that the holiday changed from honoring those who died in the Civil War to honoring any soldier who had died in any war. Who on Earth is Rachel Carson? Rachel Carson was born on May 27, 1907 and grew up in the tiny town of Springdale, Pennsylvania. As a child, Rachel helped take care of the family's farm animals. Chickens, pigs, and many dogs, were Rachel's constant companions on her nature walks. Rachel and her mother especially loved birding. She also loved reading and writing. As an eleven-year-old she became a regular contributor to the children's magazine, St. Nicholas Magazine. Rachel's parents taught her strong environmental values throughout her life. Between 1910 and 1920, Rachel watched as the population of Springdale more than doubled. As she grew older, the town grew more industry, became dirtier and more polluted. Rachel never forgot the transformation of her rural hometown into an industrial working-class community. She never forgot the damage these changes caused to the animals, birds, and plants she loved. Rachel later attended college and after two years she changed her major from English to biology, at a time when the scientific field was dominated by men. She went on to become a famous author and activist for the environment. She is most noted for her book, Silent Spring, that led to the study of the use of pesticides and the harm they were doing to plants, animals, and people and ultimately was responsible for the ban on the use of DDT in America. Though Rachel Carson died in 1964, her words have no doubt shaped the environmental movement and her words and legacy will live on. Rachel Carson Day is celebrated on her birthday, May 27th. Be sure to check our two Rachel Carson biographies to learn more about this fascinating woman. This year's theme is "EMS: More Than A Job. A Calling." Being an EMT is not an easy job. EMTs work hours somewhat similar to police officers and fire personnel: they work nights, on holidays, and are never quite sure what to expect upon arriving on a scene. Enslow's latest preschool series, All About Community Helpers, includes a title on EMTs. This 24 page book will help young students and beginning readers learn about this important job in our community. Other titles in the series include titles about dentists, firefighters, nurses, police officers, sanitation workers, teachers, and veterinarians. Join Our Book Reviewer Club Today! We are looking for people who enjoy writing about books to join our Book Reviewer Club. To find out how you can receive free books and become an Enslow book reviewer, check out our Reviewer Guidelines. Reviewers must be able to write and post honest book reviews online to a blog or to one of our suggested websites. Sign up here today! It's national First Aid Week, and to commemorate America's four-legged first responders, we present: 5 Things You Didn't Know About Police Dogs, from our popular book: Police Dog Heroes by Linda Bozzo. 1. The first police dog training school was established in Ghent, Belgium in 1899. 2. Originally, the main job of police dogs was protecting police officers on patrol; other jobs, like tracking, only became common later. 3. German shepherds are the most popular dog breed for police patrol work. 4. In the United States, one of the first cities to use modern police dogs was South Orange, NJ. 5. Police officers in K-9 units often have a special remote control to open the rear door of their patrol car: this allows them to let their police dog out to help even if they're away from the patrol car. 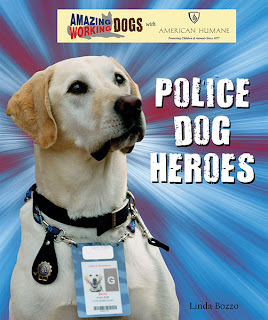 If you want to know more about police dogs, make sure to check out Police Dog Heroes from the "Amazing Working Dogs With the American Humane Society" series. LeBron has won this award for the third time in four seasons, becoming the first player since Michael Jordan to win at least three MVPs. The award was announced on Friday. Enslow Elementary's Sports Stars Who Care series includes a title on LeBron. Written for third and fourth grade readers, these 48 page books will be enjoyed by your sports-loving readers. Other titles in this series include Dale Earnhardt, Jr., David Wright, Kevin Garnett, Peyton Manning, and Tom Brady. Look What's In the Rock and Roll Hall of Fame Museum Library! Enslow is excited to find out that Black Sabbath: Pioneers of Heavy Metal by Brian Aberback from our Rebels of Rock series can be found in Rock and Roll Hall of Fame Museum library. Black Sabbath, the band that created heavy-metal music, could not envision making rock history when the band formed in Birmingham, England, in the late 1960s. Back then, the poor and working-class young men of Black Sabbath were hoping to simply make a living playing music so that they could escape a life confined to boring factory work. Black Sabbath’s journey from Birmingham to the big time is a remarkable story of highs and lows, of fallout and reconciliation. Their music and their aggressive, rebellious nature have inspired and influenced countless bands in a number of rock genres, from hard rock and heavy metal to punk to rap. Johnny Depp, along with Michelle Pfeiffer, and Chloe Grace Moretz, appeared on the Ellen Show yesterday to talk about their experience making their new movie, "Dark Shadows" that opens in theaters this Friday. Johnny also revealed his fear of dancing. You can watch the video here. To learn more about Johnny Depp, check out our Johnny Depp: Movie Megastar biography from our Hot Celebrity Biographies series. It's National Teacher Day and many communities are honoring their educators. If you're a teacher tell us how you are being honored or if you're a parent tell us how you are honoring your child's teacher. Enslow's new title coming out this fall, Teachers Help Us, lets beginning readers explore what a teacher does while helping young readers learn to recognize simple words as they are reinforced with supporting color photos. This is just one of eight titles in our new All About Community Helpers series that will be available this fall. Reserve your copy today! Bieber met with Kanye! See where they met in print! You heard it: Kanye West met up with Justin Bieber at the studio where Bieber was working on his upcoming album. Find out how Justin first met Kanye in our book, Justin Bieber: Teen Music Superstar from our Hot Celebrity Biographies series. "Like" us on Facebook and take advantage of our limited time free shipping offer. "Dark Shadows" starring Johnny Depp opens soon! Johnny Depp will be starring in the new movie "Dark Shadows" opening in theaters on May 11th. You can view the Dark Shadows movie trailer here. Did you know that Johnny Depp started his career in the early 1980s performing in a band call the Flame? To earn money he also worked in construction, as a mechanic, and as a telemarketer selling clocks. He even sold ballpoint pens to people over the phone before his wife introduced him to actor, Nicholas Cage. It was 1984 when Depp landed a small part in Wes Craven's A Nightmare on Elm Street. You can read more about Johnny Depp and his career in our book, Johnny Depp: Movie Megastar from our Hot Celebrity Biographies series for grades 5–9. "Like" us on Facebook and receive our limited time free shipping offer. Congratulations to our April raffle winner! Congratulations to the Media Center at Heritage Trails Elementary School in Moore, Oklahoma for winning our monthly raffle of $100 in free books! Are you on Team Jacob? The Twilight Saga: Breaking Dawn - Parts 2 arrives in theaters on November 16, 2012. You can view the teaser trailer here. If you're on Team Jacob you might want to check out who Taylor Lautner had dinner with last night here. If you'd like to learn more about Taylor Lautner and his career you can check out our Taylor Lautner: Film Superstar title from our Hot Celebrity Biographies series in paperback. Be sure to "like" us on Facebook to take advantage of our Free Shipping Offer for a limited time only.